My name is Karl Dean, and I am from the United Kingdom. I'm a bright, happy and easy-going person with a good sense of humor. In 1972, I was born Hull. I am the baby of the family with three older sisters. You can imagine that it was a tough life growing up with three older sisters in a 3-bedroom house! Just like The Waltons on TV! I am a fighter, I never give up! I can remember the time I went swimming at school. I wanted to pick up a hoop from the bottom of the swimming pool but I couldn't get down to pick up the hoop. In those instances when I did manage to get down, I couldn't get back up so Kay, the swimming instructor, had to rescue me from drowning. (Thanks, Kay!) Anyway, it took me about six months to learn to dive to the bottom, pick up the hoop and come back up safely. I have Cerebral Palsy and have to spend a lot of time in a wheelchair. Although it does not get in the way of my work I feel I am fully capable and articulate in this area. Basically I have a body which some would comment that "does not work properly"
For keyboard operation I have to use a head pointer and keyboard overlay. Although this may initially seem a hindrance I have actually become quite proficient and can type at a reasonable speed. Many people would assume that I would be slow and have been pleasantly surprised if they have ever observed me working. 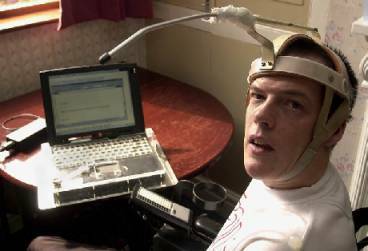 I am the first disabled student in Britain to achieve a degree using a "head pointer" device to complete my work. Using the pointer I can accomplish 12 words every minute  My biggest project is the 10,000 words Dissertation. I may be somewhat slower than an able bodied person but I always produce the results in good time and feel that the quality of my work matched and even supersedes that of some of my companions. Because of the Cerebral Palsy my speech has been affected and I am not always audible in an understandable manner. To overcome this I communicate using a speech synthesiser. This makes communication quite accessible and in other cases I either type what I want to say into my laptop or, with a little help from my friends, get a quick translation. Although people will initially find it difficult to understand me, after a short while, they soon begin to pick up words and phrases until after a short while they begin to speak to me like anybody else. It is almost like learning a new language, only it takes about 2 or 3 months to become fluent!